Escalating his face-off with West Bengal Chief Minister Mamata Banerjee, Prime Minister Narendra Modi Friday accused her of trying to protect those involved in chit fund scams and warned neither the perpetrators nor those shielding them will be spared. Modi said Banerjee's ruling TMC had inherited the legacy of "violence and atrocity" from the previous Communist government, and had "defamed" the soil of West Bengal. Attacking Banerjee, who is at the forefront of efforts to stitch together a broad-based anti-BJP coalition of opposition parties ahead of the Lok Sabha polls, Modi said the proposed 'Mahagathbandhan' (grand alliance) was 'Maha Milawat' (a grand adulderation) of people who were without any ideology or vision for the country. "Never in the history of our country have we seen a chief minister sitting on a dharna to save the corrupt. The poor want to know why did you sit on dharna to save those who are accused of negligence in probing the chit fund scam. "This chowkidar (watchman) will not spare them. Whether it is the perpetrators or their protectors, nobody will be allowed to go scot free," Modi declared while addressing a BJP rally in Jalpaiguri district. Ministers in the Union government and Banerjee are locked in a bitter exchange of words ever since the West Bengal chief minister dramatically launched a dharna to protest the CBI's bid to question Kolkata police commissioner Rajeev Kumar in the Saradha chit fund scam in which lakhs of investors were swindled of their money with the promise of astronomical returns. Modi alleged that the Trinamool Congress dispensation had taken after its predecessor Left Front government in adopting the culture of bloodshed. "Those you gave power to in Bengal in the name of 'maa, maati, manush (mother, motherland and man--the TMC's poll slogan) have followed the culture of bloodshed of their Communist predecessors," he said, branding the TMC government "Communist part 2". Recalling Bengal's rich cultural heritage, Modi said, "Today, law and order is in a shambles, industries and businesses are in ruins and young people are migrating to other states for jobs. This government has defamed 'maati' of Bengal and rendered its people 'majboor' (helpless)." He said though 'Didi' (elder sister as Mamata is fondly addressed) was at the helm of the government, it was an "extortionist syndicate" that was virtually running the administration. "We are bringing back the corrupt from other countries and they are bent upon saving the corrupt here. 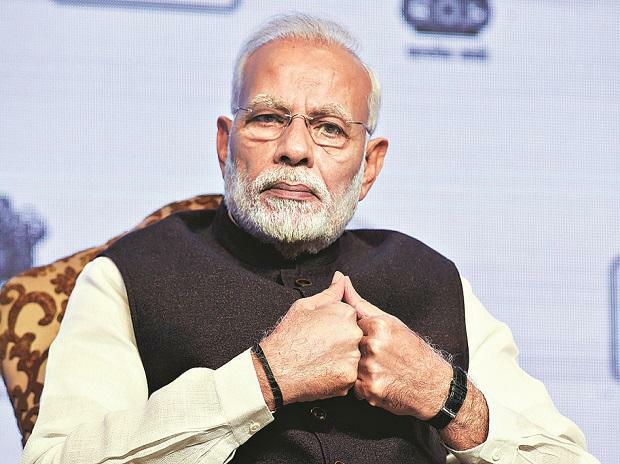 Everybody who is corrupt is afraid of Modi," the prime minister said in an apparent reference to the government's efforts to bring back fugitive tycoon Vijay Mallya. Highlighting the contradictions among the probable constituents of the proposed opposition alliance, Modi said while Congress leaders in West Bengal accused the TMC government of being undemocratic, "in Delhi, the brother-in- law of Robert Vadra is calling up Mamata Banerjee to extend his support". He berated the state government for thwarting rallies of BJP leaders by denying permission for their helicopters to land. "The government here welcomes even infiltrators, but leaders of the BJP who follow the ideals of Vivekananda and have the resolve of Syama Prasad Mookerjee (founder of BJP's forerunner Jana Sangh) are being prevented from holding rallies. This shows that the ground is slipping from under Didi's feet," he said. The prime minister attacked the Congress over its women's wing chief Sushmita Dev's assertion that the law against instant triple talaq will be scrapped if the party was voted to power. "The Congress's agenda of appeasement stands exposed. Just like it committed the mistake in Shah Bano case (when Rajiv Gandhi was the PM), it is committing another mistake now. "They don't have any regard for the Supreme Court which has outlawed the practice. They want Muslim women to be ruined. They say they will scrap the law. I assure Muslim women that nobody will be allowed to scrap the law," he said. The Shah Bano case related to a controversial maintenance lawsuit on which the apex court delivered a judgment favouring maintenance for a divorced Muslim woman. However, the then Congress government gave in to the Muslim clergy and enacted a law that placed the burden of maintenance on the woman's relatives or the Wakf Board. Predicting the downfall of the TMC government in the next elections, Modi said BJP's performance in neighbouring Tripura will be replicated in West Bengal. "Nobody dared to take on the TMC goons in the past. We are determined to rid Bengal of them. BJP workers are not afraid of anybody. If it were so, BJP wouldn't have gained strength and risen from having just two MPs to forming its government," he asserted. Modi also launched a 'rath' (chariot) that would tour every part of the state and seek views of people on providing better governance.